ORDER THE CD NOW through Paypal! Now booking for the Holiday Season! Traditionally garbed Victorian Carolers will fill the winter air with the bright sounds of the season, bringing holiday cheer to young and old alike. 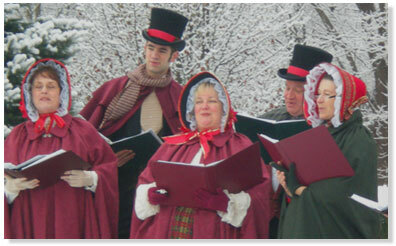 Whether caroling at the door to greet your guests, strolling through a reception or leading a sing-a-long, the Connecticut Yuletide Carolers will make your holiday event a standout! Our repertoire includes beautiful holiday music sung a capella in four-part harmony. Flexible performances, tailored to your event. Available for private and corporate parties, holiday events, family gatherings, shopping malls and outdoor venues. 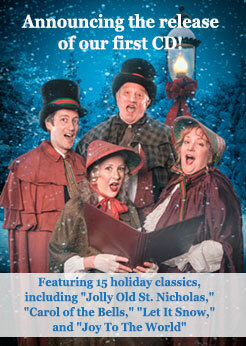 The Connecticut Yuletide Carolers are produced by MiLo Productions, presenters of the Shoreline Cabaret Series.